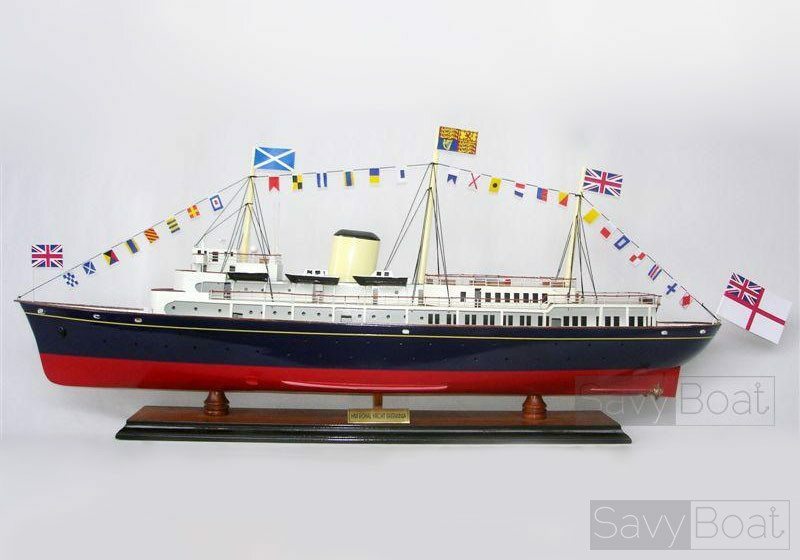 Dimension approx: 29″ L x 4″ W x 12.5″ H.
Her Majesty’s Yacht Britannia is the former Royal Yacht of the British monarch, Queen Elizabeth II. She was the 83rd such vessel since the restoration of King Charles II in 1660. She is the second royal yacht to bear the name, the first being the famous racing cutter built for The Prince of Wales in 1893. She is now permanently moored as an exhibition ship at Ocean Terminal, Leith, Edinburgh, Scotland. 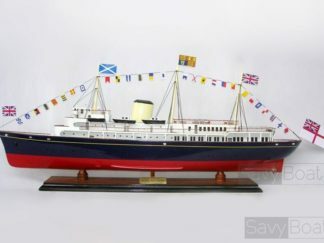 Construction HMY Britannia was built at the shipyard of John Brown & Co. Ltd in Clydebank, West Dunbartonshire, UK, being launched by Her Majesty Queen Elizabeth II on 16 April 1953 and commissioned on 11 January 1954. The ship was designed with three masts, a 133-foot (41 m) foremast, a 139-foot (42 m) mainmast, and a 118-foot (36 m) mizzenmast. The top 20 feet (6.1 m) of the foremast and mainmast were hinged, to allow the ship to pass under bridges. 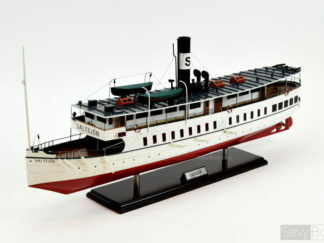 Britannia was designed to be converted into a hospital ship in time of war, although this capability was never used. 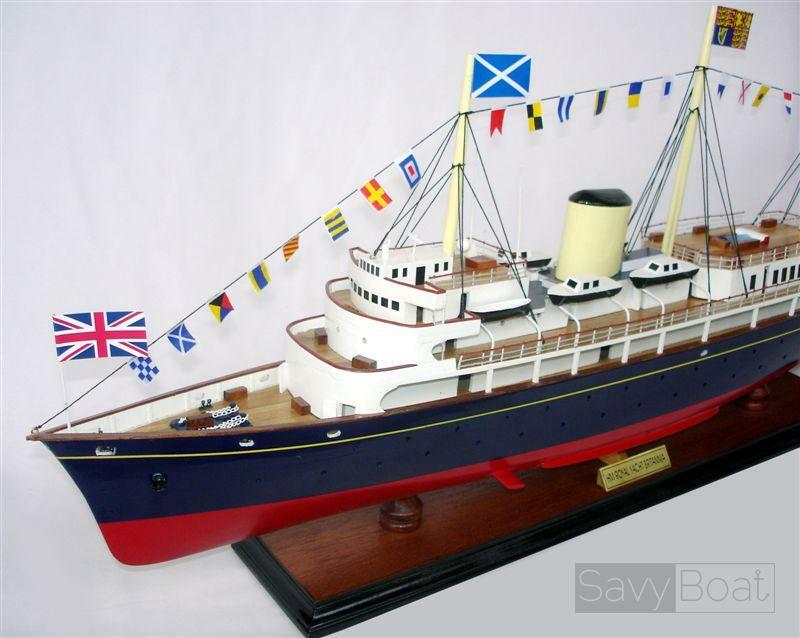 In the event of nuclear war it was intended that the Queen would take refuge aboard Britannia along the North West coast of Scotland Crew The crew of Royal Yachtsmen were volunteers from the general service of the Royal Navy. Officers were appointed for up to two years, while the “yachtsmen” were drafted as volunteers and after 365 days’ service could be admitted to “The Permanent Royal Yacht Service” (upon volunteering and subsequently being accepted) as Royal Yachtsmen and served until they chose to leave the Royal Yacht Service or were dismissed for medical or disciplinary reasons. As a result, some served for 20 years or more. The ship also carried a platoon of Royal Marines when members of the Royal Family were on board. History Britannia sailed on her maiden voyage from Portsmouth to Grand Harbour, Malta, departing 14 April and arriving 22 April 1954. She carried Princess Anne and Prince Charles to Malta in order for them to meet the Queen and Prince Philip in Tobruk at the end of the royal couple’s Commonwealth Tour. The Queen and Prince Philip embarked on Britannia for the first time in Tobruk on 1 May 1954. On 20 July 1959, Britannia sailed the newly opened Saint Lawrence Seaway en route to Chicago, where she docked, making the Queen the first Canadian monarch to visit the city. U.S. President Dwight D. Eisenhower was aboard Britannia for part of this cruise; Presidents Gerald Ford, Ronald Reagan and Bill Clinton also were later welcomed aboard the Yacht. Charles and Diana, the Prince and Princess of Wales, took their honeymoon cruise aboard Britannia in 1981. 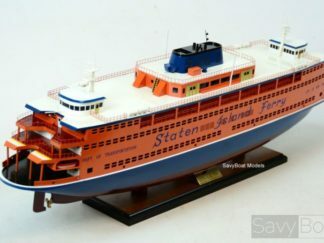 The ship also evacuated over 1,000 refugees from the civil war in Aden in 1986. According to journalist Andrew Marr in his book The Real Elizabeth (2012), at least as of 1965, the British government planned for the Royal Yacht to serve as the Queen’s refuge in the event of nuclear war. Peter Hennessy wrote, “It was her floating nuclear bunker… it would lurk in the sea lochs on the north-west coast of Scotland; the mountains would shield it from the Soviet radar and at night it would go quietly from one sea loch to another.” During her career as Royal Yacht Britannia conveyed the Queen, other members of the Royal Family, and various dignitaries on 696 foreign visits and 272 visits in British waters. 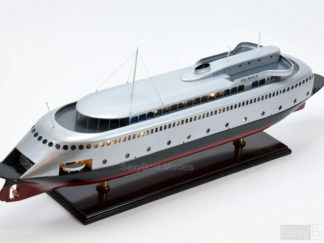 In this time Britannia steamed 1,087,623 nautical miles (2,014,278 km) Replacement In 1997, John Major’s Conservative government committed itself to replacing the Royal Yacht if re-elected, while the Labour Party declined to disclose its plans for the vessel. Following Labour’s victory on 1 May 1997 it was announced that the vessel would be retired and no replacement would be built. 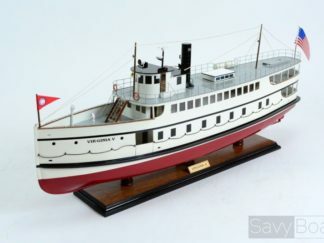 The Conservative government argued that the cost of the vessel was justified by its role in foreign policy and promoting British interests abroad, particularly through conferences held by British Invisibles. When canceling the replacement of the vessel, the new Labour government argued that the expenditure could not be justified given the other pressures on the defense budget (from which it would be funded and maintained). 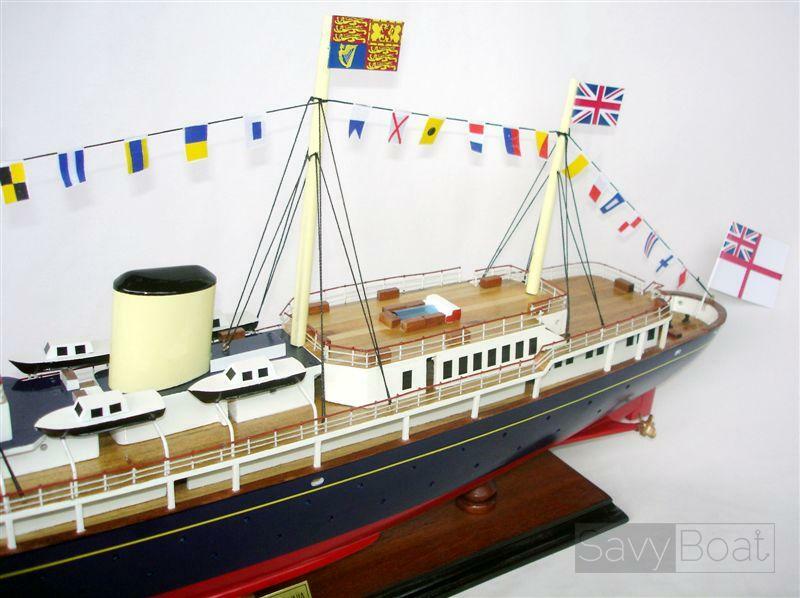 Proposals for the construction of a new royal yacht, perhaps financed through a loan or by the Sovereign’s own funds, have since made little headway. 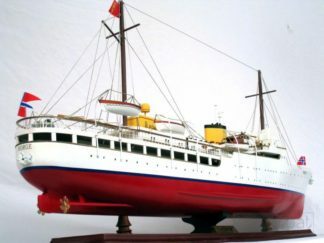 The Royal Yacht’s last foreign mission was to convey the last governor of Hong Kong, Chris Patten (now The Lord Patten of Barnes), and the Prince of Wales away from Hong Kong after its handover to the People’s Republic of China on 1 July 1997. Britannia was decommissioned on 11 December 1997. Retirement There was some controversy over the siting of the ship, with some arguing that she would be better moored on the Clyde, where she was built, than in Edinburgh, with which the yacht had few links. However, her positioning in Leith coincided with a redevelopment of the harbour area, and the advent of Scottish devolution. The Queen was reported to have wept at the decommissioning ceremony, which she attended along with most of the senior members of the Royal Family. 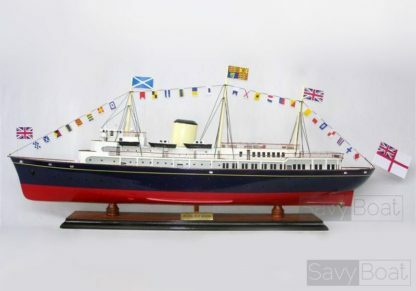 Listed as part of the National Historic Fleet, Core Collection, Britannia is now permanently moored as a five-star visitor attraction in the historic Port of Leith, Edinburgh, Scotland, and is cared for by the Royal Yacht Britannia Trust, a registered Scottish charity. Entrance to the yacht is via the Ocean Terminal development, and over 250,000 people visit Britannia every year. She is also one of the UK’s top evening events venues. On 18 May 2006, the Swiss-born Hollywood actress and first Bond girl, Ursula Andress, celebrated her 70th birthday on board the Royal Yacht. On 29 July 2011, a cocktail party was held on board the Britannia for Queen Elizabeth’s granddaughter Zara Phillips and her husband Mike Tindall to celebrate their upcoming wedding; the yacht had been hired for the occasion. A retired Rolls-Royce Phantom V state car, owned by the royal family in the 1960s, is on display in the purpose-built garage aboard Britannia. Other highlights of the tour of the five decks that are open to the public include the Queen’s Bedroom (behind a glass wall), and the State Dining Room. The Royal Deck Tea Room opened in 2009. 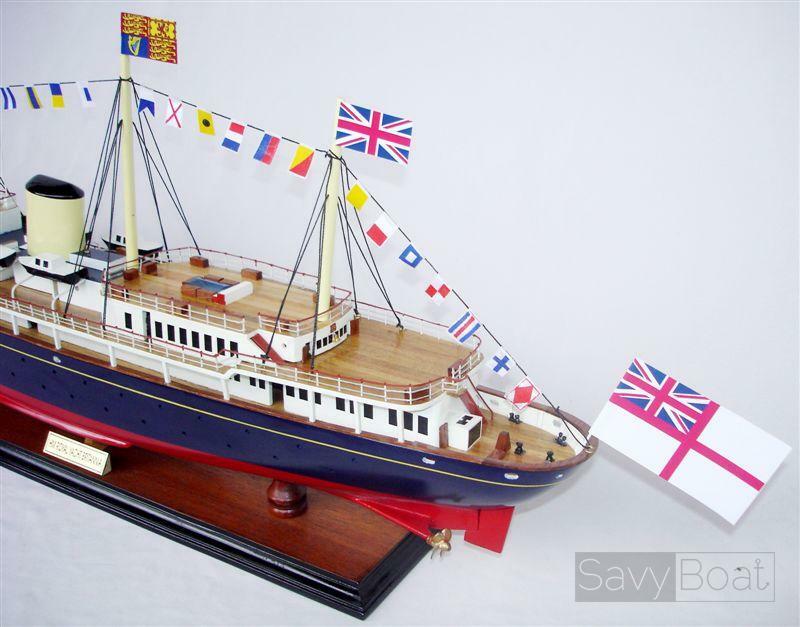 The 1936 racing yacht Bloodhound, once owned by the Queen, is now berthed alongside Britannia. Bloodhound was one of the most successful ocean-racing yachts ever built and was also the yacht on which both the Prince of Wales and Princess Royal learned to sail. The Royal Yacht Britannia Trust bought Bloodhound in early 2010 and she is the centerpiece of an exhibition focusing on the Royal Family’s passion for sailing. Visitors can view Bloodhound from a specially built pontoon when the racing yacht is in port.